Newly passed Bill 7 allows the police to take tents, clothes, food, and anything at all from anyone on the sidewalk. 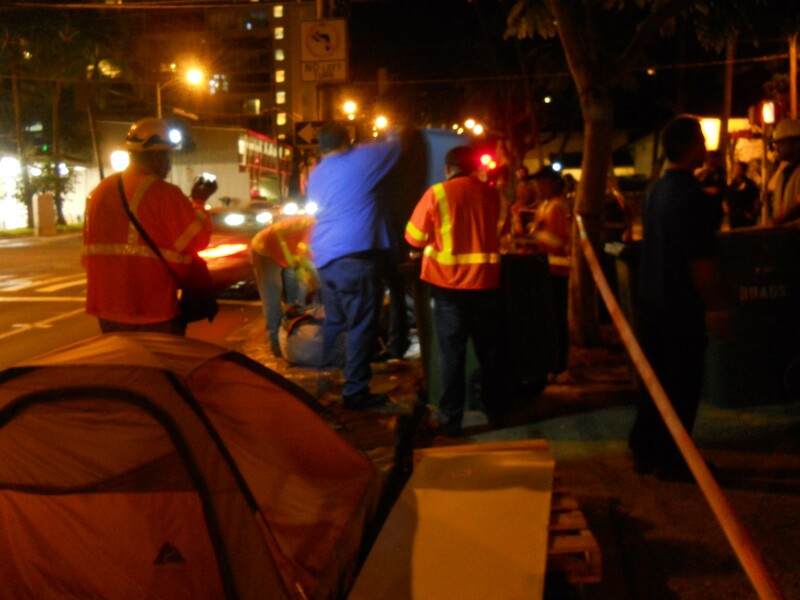 It has been used to raid other homeless encampments, but not deOccupy Honolulu. Until tonight. What does this mean? Is this the end of deOccupy? Who will speak for the homeless? Join your bothers and sisters at the Kakaako homestead. It's getting larger day by day and would make it the largest occupy camp ever. As the City takes the tents that serve as the homes for the "homeless," the actual population of the homeless grows. There are large encampments at Kakaako as you mention, and also at "Piano" park on King Street and at the Waianae Boat Harbor. The growing homeless population is an indicator of growing financial and social inequity, and that's what I would like to see addressed. thanks dough for all your ongoing work. i repost you ongoing too. when i have a way.